The Oregon Museum of Science & Industry here in Portland hosts regular events where adults can come to the museum after hours and enjoy drinks while getting to act like kids. There is usually some kind of theme to the evening and this month they dovetailed with Portland Cocktail Week and the Great American Distillers Festival to provide another opportunity to taste spirits from local distillers. As there were both a number of spirits that I didn't get to try at the GADF represented at this event as well as others that weren't present on Sunday, I decided to go, this time with more food in my belly. Once again, here are some small impressions from what I tried. However it was still hard to get much depth given that I was drinking out of a shot glass most of the time. •Blair Reynolds, the former Trader Tiki, is a fine gentleman. His white dog hot toddy was a little peculiar, but an interesting drink. I also really liked the hazelnut orgeat and will probably pick up a bottle to give my mai tais a twist. •I finally got to try Clear Creek's 8-Year Old Apple Brandy. It's an interesting contrast to the 2-Year Old version. Whereas the younger brandy is bursting with apple flavor, its older sibling has been significantly tamed by the extra time in the barrel. It's a little less identifiable as an apple brandy, edging towards a nice cognac with a more diffuse fruitiness. While it's a little thin at first, a drop of water opens it up nicely. The taste is berries with a hints of vanilla and wine, balanced by mild oakiness. I'm definitely going to spring for a small bottle of this brandy so I can do a more in-depth review. •Big Bottom Port Cask Finish Whiskey is excellent stuff. Much like the Angel's Envy whiskey I tried on Sunday, the bourbon for this whiskey is sourced from another distiller and then finished in used port casks. I chatted for a bit with Ted Pappas, the founder of Big Bottom, and he mentioned that this whiskey is sourced from Indiana. While Ted would "neither confirm nor deny" his source, the mash bill matches perfectly with the high rye juice from the notoriously guarded Lawrenceburg Distillers Indiana (LDI). While this is a younger 3-year old whiskey compared to AE's five and six-year old base, it tasted mature beyond its years. The choice of tawny rather than ruby port seems more well suited to bourbon and the two meshed quite well. There was a solid bourbon base of corn, grain, vanilla and a healthy dose of rye spiciness up front. This was followed by the rich flavors of tawny port nearer the finish. The residue of this whiskey was very more-ish and I'm definitely going to buy a bottle. •The Meadow is a store in Portland that sells speciality ingredients like salt, chocolate and bitters. They had quite a spread at this event. Not only were there several dozen commercial bitters, but they also put out nearly as many tinctures that people could use to create their own bitters. I took a whiff of a number of different bitters. The Bitterman's Xocolatl Mole bitters and Elemakule Tiki bitters were probably my favorites, but Elmegirab Aphrodite bitters were also quite intriguing. I need to start playing around with bitters again because they're a relatively cheap way to add more variety to drinks. •I made the mistake of giving Oregon Spirits another chance. They're releasing a genever-style gin and that was abundantly clear from the first sip. It's full of the peculiar roasted pineapple flavor that I've noticed in other genevers. Unfortunately there really wasn't much else going on and I couldn't even find any juniper among the malt flavors. I'm going to give them a miss for a while until they have some more experience under their belts. •Thankfully the Rogue Pink Spruce Gin was much better. I'd tried it before, but wasn't much for straight spirits at that point. This time I really liked the gin. There was a solid base of juniper and spruce pine flavor. This was complimented by a very whiskey-ish layer of sweet vanilla, candied fruit and cinnamon spice. This would make a great Old Tom substitution or is perfectly pleasant for sipping neat. Another one that's getting added to my 'to buy' list. Overall it was a really nice event. I was glad that I showed up not too long after opening because it got much more crowded as the evening went on. However, I got to try everything I wanted to sample and usually didn't have to wait too long. The complimentary shot glasses and hot water to wash them out was a nice touch and probably cut down a lot on the waste the event produced. Finding a few new products that I liked enough to buy was icing on the cake. While I wasn't able to attend any of the other events during Portland Cocktail week, I did make it to the second day of the Great American Distillers Festival on Sunday. Held in a small-ish event hall, there was still quite a lot of booze spread before me when I entered. Unfortunately my stomach was a little too empty to make it to every booth, but I did get to try a number of interesting products. My thoughts were a little sparse and became more so as I was plied with whisk(e)y, but here's what struck me at the time. •12 Bridges Gin keeps getting better. Their latest release has dialed back the cucumber notes that used to dominate the gin and become very pleasantly floral. It was also good to hear that their distribution issues are local, rather than being a supply issue. •Cyrus Noble whiskey is totally decent. This private label bottling of Kentucky bourbon has some corn sweetness and vanilla without any noticeable harshness. Probably worth another try when I can have more than a fraction of an ounce, but it's pretty obvious that this bourbon doesn't have more than five years under its belt. Value will be highly dependent on the price-point. •Dry Fly Washington Wheat Whiskey is also totally decent. I found it to be quite gentle for only two years in the barrel. The flavor was grainy, without bourbon's corn sweetness or vanilla due to the pure wheat mash bill. The fact that it's an agricultural product was still clear given that the barrel hasn't had time to dominate. Again, probably worth another try, but it didn't jump out at me with complexity. However, I also felt the same way about Berheim's wheated whiskey, so it may just be that the category isn't for me. •Chatoe Rogue is a new-ish single malt whiskey from Oregon. If I understood correctly, it's aged briefly for 3 months in used chardonnay barrels. This whiskey tastes very fresh, which is unsurprising given how close it is to being a white dog. While there isn't a whole lot of complexity yet, it's still pretty decent for its age and might work well in a New Orleans sour with some orange liqueur and lime juice to round out the flavors. But at the price point, it's kind of a tough sell. •I tried a number of Golden Distillery's products. Their single malt whiskey had a surprising dose of vanilla in it, which comes from being aged in white oak 10 gallon, rather than standard 53 gallon, barrels. It was another good, relatively fresh product that should improve nicely with more age. I also tried their Reserve whiskey, which is also aged in red oak barrels. It was hard for me to suss out any extra flavors, but my palette was getting a bit burned out at that point. Their apple brandy unfortunately seemed kind of thin and fient-y without the kind of rich apple flavor that I expect. On that front, I think I'll stick with Clear Creek. 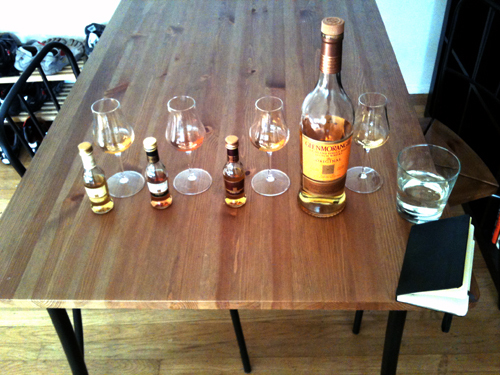 •Just to prove that it wasn't just the little guys, I also tried the 12- and 18-year old bottlings from Jameson. In all honesty, they really did nothing for me. Again, my taste buds may have just been too abused to catch the subtleties, but I didn't even finish the sample of the 18-year that I was offered. C'est la vie, I guess. •Oregon Spirits' wheated whiskey was also a bit simple for my taste, but it might get more interesting with age. •Angel's Envy whiskey was another private bottling, rather than a local product like so much of what was at the Festival. This is a five to six year old bourbon that is then additionally aged for 3 to six months in port casks. This was the last whiskey I tried while I was there, so it was nearly impossible for me to pick up on much. While I'd need to try it again to be sure, I felt like this was another case where I felt like it needed a lot more age. With some 10+ year old stocks and another 6-12 months in the port casks, this could be really good. But it's hard to justify shelling out $50 for something so young that isn't even coming from a craft distillery, even if it has been reviewed very, very favorably. •Some of the big boys were there to play as well. Four Roses put out quite a nice spread of spirits. While I had previously tried their Small Batch bottling and found it less than appealing, their Single Barrel (Warehouse 5, Barrel 3-6U) was quite a bit better. It had a fairly light nose with hints of brown sugar, vanilla, yeast and caramel. The taste recapitulated the smells and had only a slight burn. I also got to try some of one of their Limited Edition bottlings (sorry, I forgot to write down the details of what all went into it), which was at least as good if not better than the Single Barrel. They're both on my 'to try again' list and it sounds like the price of the Small Batch and Single Barrel should both be coming down in the near future. So overall, the unfortunate impression that I came away with is that most craft whiskies are just too young right now. I'm not the first to come to that conclusion. Right now they're in a really tough place. I think a lot of people have gotten into distilling because they want to make whiskey, but unfortunately that's as much or more dependent on time in the barrel than it is on what comes off the still. And that's expensive. Aging ties up both space and capital, neither of which are likely to be plentiful for a company that's just starting out and wants to become profitable sooner rather than later. This can lead to a number of different traps, all of which are tricky to get out of. To begin with, just about every distillery out there makes vodka and gin. This isn't surprising, because they're comparatively easy to make and require no aging. This can start a decent revenue stream. But if the dream is ultimately to make aged products, it's hard to build enough capacity to both keep up with the demand for your unaged products and to distill the stuff that you want to put down for a while. Sure, you can always buy another still, but that costs money, which usually isn't exactly plentiful for new distilleries. Another route that many distilleries are taking is to bottle whiskey bought from one of the big distilleries. It's not uncommon that they have barrels sitting around that don't quite fit into their established products but are on their own still worth drinking. This is a totally reasonable idea, but has its own complications. It's early days, so we'll see how and whether people are able to transition over to their own aged whiskies, but it's going to be a tough switch. Lastly, and most popularly, distilleries release whiskies that haven't had a lot of time in barrels. As I mentioned above, some people try to speed this along by using smaller barrels, but it's debatable how much that helps. Some of the reactions that produce the flavorful compounds in whiskey take time to develop and there's no way to speed up the process. Especially with single malt whiskies, time in the barrel seems to be particularly important as they're starting with a single grain rather than the mixtures used for bourbon. I think there's a good reason why scotch usually starts to get really good around 10-12 years. Again, as I mentioned above, there are a lot of whiskies coming to the market with a few months to a few years under their belts. Sometimes that works. I've tried a few 4-5 year old whiskies from microdistilleries that were quite tasty. Even less can still sometimes produce a great product. But you have to accept them for what they are, rather than expecting the rich, vanilla and sweetness-laden whiskey that most bourbon drinkers know and love. And when you consider the price differential between most craft-distilled whiskies and those made by bigger producers, it can get tough to justify shelling out that much cash. I feel like in a lot of cases people (myself included) are willing to pay a premium for what they see as potential, rather than because what's being current put out is the best thing ever. Craft distilleries have to work with what they have, whereas big distilleries have decades of stock to blend into consistent products. So there are hits and misses. Unfortunately it's going to be tough to bring in a wider audience that is accustomed to consistency. While I feel like I've been a bit doom and gloom, I don't think that all is lost. It's early days and craft distilleries that have been around for a while are putting out really excellent products. However, there does seem to be no small amount of hype and I'd hate for some good projects to be nipped in the bud because they can't deliver right now. In another 5-10 years, I expect to be drinking a lot more really excellent craft whiskey. But right now I'm hoping that there's a lot of what I drank this last weekend sitting in barrels, waiting to see the light of day some time in the slightly distant future. About a month ago I was lucky enough to stumble upon a Glenmorangie gift pack containing a full bottle of the Original expression and minis of the three current wine barrel extra-aged bottlings, all for the same price as the Original by itself. This lets me do a tasting where I can directly compare how each type of barrel affects the flavor of the underlying whisky. Glenmorangie has been distilling since 1843 in Tain, Ross-shire, Scotland. While the distillery was family owned for most of its history, it has since been sold to the French conglomerate LVMH. The new owners have brought new design ideas to the company. I've got to say that their presentation is top-notch and the corporate website does an excellent job of conveying their story and providing some rather nice videos for tasting their original and extra-aged expression. The distillery's claim to fame comes from having the tallest stills in Scotland, which produce lighter bodied whiskies that are the most popular in Scotland. Staffed by the so-called "Sixteen Men of Tain", the distillery seems to manage a good balance between tradition and experimentation. Almost all of their whiskies are first aged in used bourbon barrels and their extra-aged expressions are then transferred to used wine casks to add another layer of flavor. Overall this is a seriously solid dram. It's extremely well priced for a single malt, going for as little as $30. There's absolutely nothing bad that I can say about it, other than wishing that the flavors were just a bit more bold. Especially when my palate isn't quite as clear, the flavors tend to seem less robust and the cacao notes are replaced by green apples. I'd stick to drinking this before rather than after a meal. This whisky makes me think of 3 Musketeers bars. I've tried a few other sherried whiskies that really didn't do much for me. This was a much more enjoyable expression. There is clear sherry flavors in both the nose and taste, but it doesn't dominate the underlying characteristics of the whisky. This is a very delicious and more-ish dram. There are a lot of similarities between the Quinta Ruban and Lasanta expressions, though I felt like the port wine influence was just a tad less strong than the sherry. While the nose of the Lasanta is a bit more robust, the finish on the Quinta Ruban helps its overall experience. Ultimately I'd have a very hard time deciding between these two. I felt like the wine influence was less directly apparent with this expression, instead beefing up the intrinsic qualities of the Original and layering on more barrel flavor. I didn't find this to be as explosively sweet as other reviewers have, but it is smoother than the Original which might let that aspect shine a little bit more clearly. Overall, I don't think you can go wrong with any one of these whiskies. As I noted above, the Original is an incredible value and a great whisky for the scotch novice or those who prefer lighter Speyside malts. The Lasanta and Quinta Ruban expressions are usually less than $10 over the basic 10-Year, so it's easy to upgrade. At least for me, the Nectar d'Or is a little harder to justify as it's usually up in the $60-70 range. I'll probably add it to my collection one of these days when I have some extra cash, but the port and sherry cask expressions are in the must-buy category. It seems to be a requirement of cocktail blogging that at some point, you will write a post about the mai tai. Perhaps several. I've even mentioned it once before. But really, there's a good reason that it comes up so often. From a fairly simple set of ingredients, the mai tai is much greater than the sum of its parts. A combination of rum, lime, orange liqueur and orgeat comes together with almost unmatched depth and complexity. And that's without too many of the usual tiki drink tricks, like multiple juices and highly spiced syrups and liqueurs. All of that can be attributed to the genius of Victor 'Trader Vic' Bergeron who invented the mai tai (yes, I come down on that side of the great Mai Tai Debate). Combine all ingredients, shake with ice and strain into a chilled cocktail glass, either up or over crushed ice. Garnishing with a mint sprig is traditional and does add a little something to the drink. The basis of this drink is obviously rum. Originally developed with Wray & Nephew 17 Year Dagger rum, a bottle of that will set you back as much as a new luxury car, so adaptations have to be made. The general consensus seems to be that a combination of an aged Jamaican rum and an aged Martinique rhum agricole best approximate the original flavor. However, there are quite a number of other variations that will work as well. If you're aiming for something along the classic lines, your options are a significantly more limited on the Jamaican rum side. My go-to rums in this category are Appleton V/X and Estate Extra plus Smith & Cross. The Appleton 12 Year is best on its own, but I usually go for some split between Appleton V/X and S&C as they both bring some nice funk to the table. Both because of proof and the fact that it's made from pure pot still rums, the S&C will make itself strongly present, even at 0.25 oz, so go easy with the pour. There's also Coruba, but its strong burnt sugar flavor will also tend to dominate the drink, so it's not something I tend to reach for when I'm making mai tais. And while there is still a Wray & Nephew rum on the market, it's an unaged firebreather that really isn't what you're looking for in a mai tai rum. On the sugar cane rum side of the equation, there's quite a bit more to choose from. First up, the official Martinique rhum agricoles. While I and others have sung its praises before, Clément VSOP isn't my favorite here. For whatever reason, it seems to be hiding its light under a bushel in this drink, so I don't want to waste its deliciousness. Rhum J.M. and Neisson Elévé Sous Bois are both solid and won't set your wallet back too far, but they are also pretty stiff and may be a bit much depending on your opinion of rhum agricole. Next on the list are non-AOC sugar cane rhums from other islands. Barbancourt is an obvious choice, especially as its price point is far below that of the Martinique rhums. Another good choice is Westerhall Plantation rum, which is made with both cane juice and molasses rums. It's fairly light, but will provide a nice backup to whatever Jamaican-style rum you want to use. Lastly, Mt. Gay Sugar Cane Rum, which is oddly nothing of the sort. As I mentioned before, this is a molasses-based rum that magically manages to express many of the characteristics of a sugar cane juice rhum. Sadly it's not being made any more, but if you can find a bottle it does work wonders in a mai tai. If you want something a bit lighter, I also like a variation with Banks 5 Island (has some Jaimaican rum in the blend and the Batavia Arrack brings some really nice funk to the table) and Clément Première Canne (a nice but fairly mellow rhum agricole blanc). Makes for a good summer mai tai. What's amazing about the mai tai is how adaptable it is to other spirits. 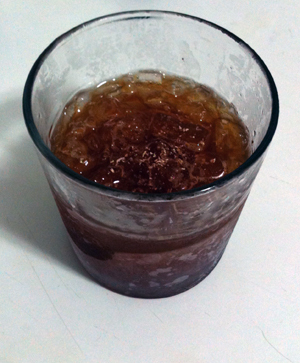 However, one does have to keep in mind that the drink was built with rum in mind, so some subtle tweaks may be necessary. The whiskey version of the mai tai was known as the Honi Honi in Trader Vic's restaurants, though this was a simple substitution with 2 oz of one kind of bourbon. While this drink works quite well, even with something as simple as Jim Beam white label (I had an excellent one the last time the Teardrop Lounge hosted a tiki night), it feels like there's room to play with this formula. The first thought in my mind was, "what whiskies will approximate the flavors of Jamaican and agricole rums?". This is kind of a tricky thing. There aren't too many whiskies that have the same kind of pot still funk that are the hallmark of Jamaican rums. By the same token, Martinique rhums have a rather unique flavor that is often (in my mind) reminiscent of brandy. So there are two different routes available: pick what seem like their analogs within the whiskey world (funky and fresh) or most faithfully recapitulate those flavors. For the first, I would suggest the most robust whiskey you can get your hands on and a rye whiskey. If you can't get funky, at least get bold. Bulleit, Elijah Craig 12 Year or Ezra B Single Barrel would all be good choices for the first that won't break the bank or make you cringe to mix them. As a Martinique replacement, I lean towards rye whiskey because it seems to possess both the semi-obscure peculiarity of Martinique rum and flavors that remind you that it's an agricultural product. For the second route I would stick with a bold bourbon, but add a sherry-cask aged Scotch whisky (I've tried this with Aberlour 12 Year to reasonably good effect), which will have the wine-like flavors that one can find in rhum agricoles. Both are good, but which you like better will depend on your personal tastes. This is another mai tai variation that has an established history as the Pinky Gonzoles. But again, this is a fairly simple sub of 2 oz of a single kind of tequila. While all well and good, I prefer to use 1 oz of an añejo tequila like Sauza Hornitos and a reasonably funky reposado like Cazadores. That way you get both the aged barrel flavors of caramel and vanilla of the añejo and the funky agricultural flavors from the younger tequila. Here's where we diverge from the beaten path. Gin is somewhat more divorced from its agricultural roots, with the exception of maltier gins like Dutch genevere. But you can still make an excellent gin-based mai-tai. For depth, you're probably going to want some kind of a barrel-aged gin. I went with Ransom Old Tom, though it at least the bottle I have needs to be used sparingly (~3/8 oz) as its somewhat overwhelming cardamom flavor can swamp a drink. For the balance of the spirit, I went with Aviation and Hendrick's, both solid, not too juniper-y gins that will still give the drink a nice snap. So there you have it. The mai tai is a true classic, both in its original form and in the derivatives that were spawned from it. While falling on hard times for much of the late 20th century, many are new recognizing how good this drink can be when hewing to Trader Vic's formulation. A few simple ingredients turn into something downright magical. Old bottle on the left, new bottle on the right. While Lemon Hart 151 is a somewhat obscure spirit outside of tiki circles, within it is one of the best loved ingredients out there. A potent rum distilled by Demerara Distillers Ltd. in Guyana and bottled by the Lemon Hart Company, this rum has a surprisingly long history. The eponymous Mr. 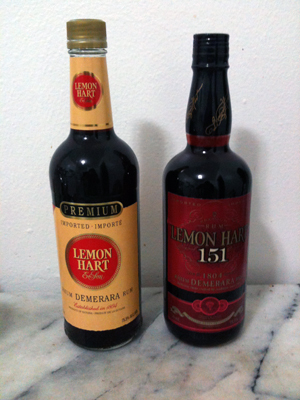 Lemon Hart began supplying the British Navy with rum at the beginning of the 19th century. While the Lemon Hart brand remained quite popular for nearly two centuries, it slipped into relative obscurity outside of Canada after the first wave of tiki wound down in the late 70s and early 80s. The resurgence of tiki drinks and culture began to bring it back into the light, though the brand retained a very simple and unassuming packaging that belied the prominent "premium" statement on the label. To make matters worse, a change in ownership last year meant that it looked like the brand would disappear completely as the new owners had not made arrangements with DDL to continuing using the trademarked "Demerara rum" name. There was great wailing and gnashing of teeth among the tiki community. Thankfully everything was eventually settled, but there was a 6-12 month period when LH151 was nearly impossible to find for love or money. Now it has returned to shelves with much more upmarket packaging. It's clear that the new owners are trying to reposition this rum, both in terms of the presentations and a slight (~$5) increase in the price. Brought down to a more tractable 100 proof, this rum is still has quite potent flavors. On the nose, there's quite a bit of caramelized, almost burnt sugar, molasses, tropical fruits, butter, toasted oak and a fair bit of alcohol. A couple more drops of water bring out savory notes that remind me of an Indian restaurant. The taste is primarily the caramelized to burnt sugar and smoky toasted oak, which becomes more subdued and sweeter if you add a bit more water. I'll have more to say on the subject when I review some of the other rums distilled by DDL, but Guyanese rums seem to bear some relation to Islay Scotch whisky. Combine all ingredients and blend with a handful of crushed ice for 5 seconds. Pour into a chilled glass over more crushed ice and dust with freshly ground nutmeg. This is a dangerous drink. If you use a little bit too much crushed ice, the LH151 will get too dilute and you can all too easily forget just how much alcohol is in this cocktail. 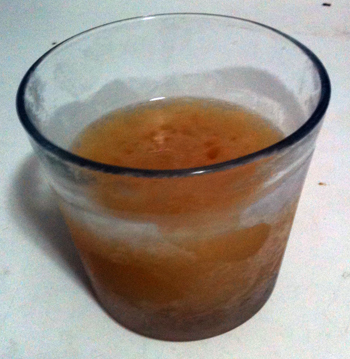 However, if you get it just right, the ice lengthens the drink as time goes on and lets the experience mellow over time. Compared to a lot of tiki drinks, this is almost blissfully easy to put together as it is little more than an extremely potent daiquiri. There's only one kind of fresh juice needed and apart from the rum, all of the ingredients are pretty easy to find. The rum is obviously prominent as it forms the bulk of the drink. The lime juice adds its usual snap and is balanced by the simple syrup. The extra touches are what make it really special. The standard Don the Beachcomber one-two punch of Angostura bitters and Herbsaint do their dance around the main flavors and are accented by the nutmeg. The rich, bold, smokey flavor of the LH151 is wonderfully complimented by these additions and everything comes together as a simple but very tasty drink.